Tag Archive | "The Championships"
If the axiom “imitation is the sincerest form of flattery” rings true, Roger Federer is a credit to his idol Pete Sampras. In the final at The Championships, Federer broke the heart of millions of Brits who have been waiting seventy six years to witness one of their own lift the trophy. 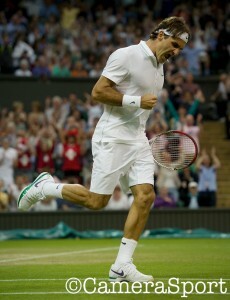 Federer prevailed over Andy Murray 4-6, 7-5, 6-3, 6-4 for a seventh Wimbledon title, tying Sampras’ record. With Rafael Nadal, his obstacle the last two years in the semifinals, knocked out in the second round, Murray seized the occasion. By vanquishing Jo-Wilfried Tsonga in the semis, Murray became the first Brit since Henry Austin in 1938 to advance to the final at the All England Club. Wimbledon 2010 was the ultimate major Serena Williams captured before being sidelined by a foot injury which led to other health complications and a year hiatus from tennis. Today, Williams came full circle by winning her first major since rejoining the tour last June. At the All England Club, Williams defeated world number three Agnieszka Radwanska in the final 6-1, 5-7, 6-2 for a fifth trophy at The Championships and her 14th major overall. Facing an opponent who is in her maiden major final, Williams had to guard against the desire to phone in the victory. In 2004, Williams, the runaway favorite, was stunned by newcomer Maria Sharapova in the Wimbledon final.